Chance The Rapper’s mind wasn’t totally on a recent ESPN The Magazine photo shoot on the West Side of Chicago. He wasn’t rude by any stretch, speaking, laughing and joking with the Chicago Bulls’ Jimmy Butler as well as the production crew and stylists. Nor was he impatient. But he had to leave by 5:20. 5:30, if I was lucky. Thankfully, I was lucky. On his schedule was his Open Mike. 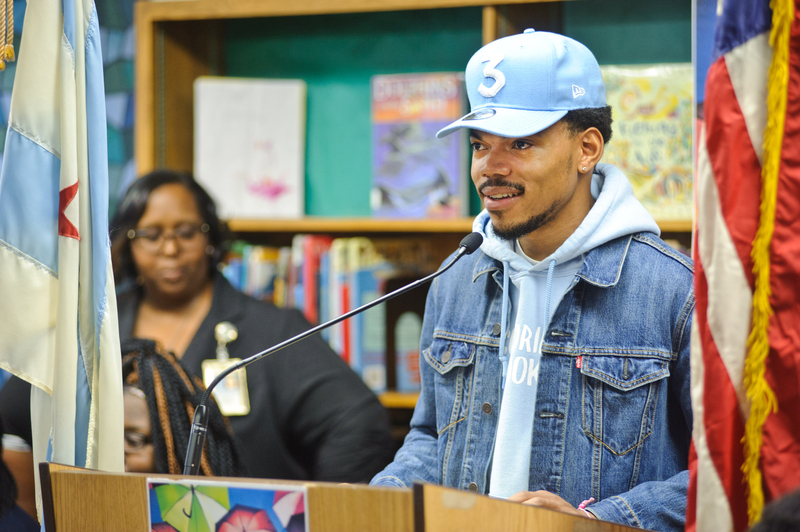 The event was held at the Harold Washington Library with a focus on providing a platform for “young creatives building the next generation of cultural community.” Previous guests at Chance’s Mike events include Chicago’s Kanye West, Vic Mensa and Jeremih. “Come through, bro,” Chance said while dapping people up before bolting. “It’s a good look.” Not going was one of my worst life decisions. There were some “stars” there — a comedian named Chappelle, the aforementioned Butler and the cast of BET’s New Edition biopic — but the night was, after all, the youth of Chicago connecting on a personal, intimate and creative wavelength with a hero not much older than themselves. Something noticeable from the moment you enter Chicago is the city’s authentic relationship to its new favorite son. Kids love Chance the Rapper. Uber drivers praise him. Bartenders salute him. Which is why it wasn’t shocking to hear the urgency and disgust in his voice last week when discussing his sit-down — or lack thereof — with Illinois governor Bruce Rauner (this isn’t his first back-and-forth with a Chicago political figure either). If they don’t want that stigma associated with their city, they should stop killing each other. As if the history of America — the history of being black in America — was ever that simple. On Monday, he donated $1 million, much of which came through ticket sales from his own shows and from AEG, Live Nation and independent promoters, to Chicago Public Schools, a system integral to his life and career’s story. A 2015 report by The Education Trust revealed Illinois earned the infamous distinction of the worst school funding system in the nation. Illinois school districts with the highest number of students living in poverty receive nearly 20 percent less than their more affluent peers. And districts with the highest enrollments of minority students receive 16 percent less than districts with the lowest enrollments of minority students. 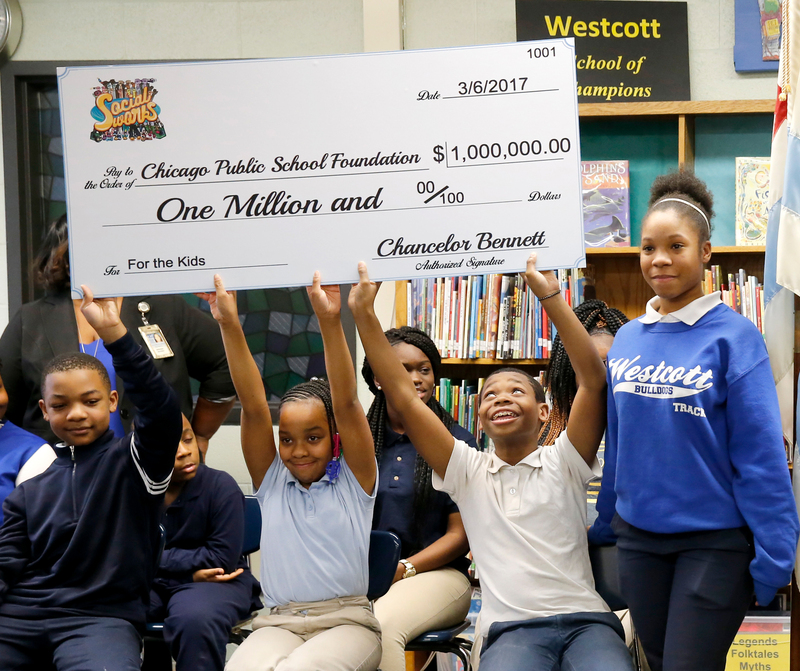 Students at the Westcott Elementary School on Chicago’s South Side hold up a check, a gift of $1 million to the Chicago Public School Foundation from Chance The Rapper, during a news conference at the school Monday, March 6. The Grammy-winning artist is calling on Illinois Gov. Bruce Rauner to use executive powers to better fund Chicago Public Schools. Chance also was not interested in focusing on the past while the future sat right in front of him. All too often, headlines reflect the massive violence in Chicago. Young men and women not even near the primes of their lives gunned down. The discussion from there is nearly textbook: Why are the South and West sides of Chicago like this? Do they not care about the value of a life in Chicago? Well, if they don’t want that stigma associated with their city, they should stop killing each other. As if the history of America — the history of being black in America — was ever that simple. If last year’s Coloring Book is Chance the Rapper’s Confessions — the critically acclaimed 2004 classic from R&B singer Usher — then Chance’s 2013 Acid Rap is Usher’s 8701 — the criminally underrated predecessor to Confessions. Both of Chance the Rapper’s projects provide a glimpse into the frustration of everyday life in America’s third largest city. They murking kids; they murder kids here/ Why you think they don’t talk about it? They deserted us here/ Where the f— is Matt Lauer at? Somebody get Katie Couric in here, he lamented on “Pusha Man,” an Acid Rap standout. Coincidentally, he sat down with Couric for an interview regarding Chicago last week. We still catching lightning bugs/ When the plague hit the backyard/ Had to come in at dark ’cause the big shorties act hard, he lamented on “Summer Friends” on Coloring Book. OK now, day camp at Grand Crossing/ First day, n—–’s shooting/ Summer school get to losing students/ But the CPD getting new recruitment. Without the $215 million, CPS announced last week, it may be forced to cut summer school and shorten the school year by three weeks. Chance The Rapper holds a news conference to announce his donation of $1 million to the Chicago Public Schools Foundation at Westcott Elementary School on March 6 in Chicago. Chance, 23, is not far removed from the hundreds of thousands of Chicago kids who look up to him. By taking on the political establishment — and putting his money where his lyrics come from — means Chance, an admitted non-politician, is in for the biggest fight of his adult life. It’s about redirecting the narratives of youth of color from the city of Chicago. No longer will they be solely blamed — without pushback — for their situation. This is a fight, via his emotions, his music and his actions, Chance the Rapper seems committed to. Chance didn’t drop the mic. That time is still to come. But in this cypher between The Rapper and The Governor, it’s all eyes on the actual public servant.